1. I am grateful for the woman at Dunkin Donuts who put 3 munchkins in the bag with my breakfast order the morning I was late for work. She put a smile on my face and turned my day around. 2. 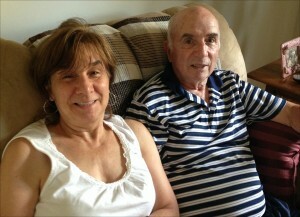 I am grateful for 2 of my customers, Jean and her husband, who shared their iced tea recipe with me. It’s so good I can’t keep the pitcher full, we keep drinking it up. 3. I am grateful for the mint in my dad’s garden so I can keep making the iced tea. 4. I am grateful I was able to spend Father’s Day with my dad. 5. I am grateful my dad decided to keep a Gratitude List too! I’m grateful to be back on the east coast and closer to my family. Your dad has a very kind face. You look a lot like him. I am also grateful you’re on the east coast. You’re closer to me and I’m looking forward to meeting you. My dad is a kind man and I’m happy to take after him. Thank you!